This is the Trilix Fountain that was recently completed for a private collector in TX. 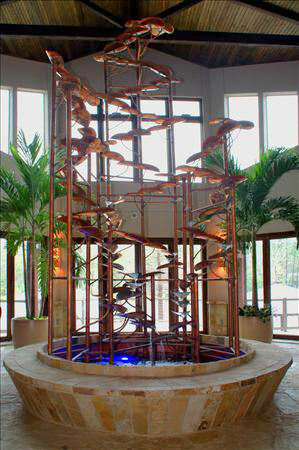 This piece stands 20' tall and is situated in a large central atrium inside a country residence. 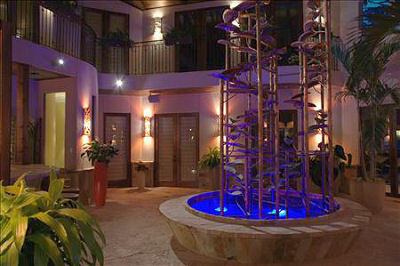 This fountain was installed and finalized on location in November 2011. When the first section was lifted into place with the help of many hands, it was a highlight of my career. It went up with ease and stood on its own, there was a cheer, and a big "high-five" from the client. It felt awesome! I finalized this fountain in place and then finally saw it come to life. I think it may be the finest piece I have created so far. It has a very gentle pleasant sound like rain and its presence is felt throughout the house. This is my second 20' tall fountain for the same client, so it feels really great to have someone so endorse my creativity and to allow me to grow to these new heights. I greatly appreciate my client for his two fountain purchases and his gentle approach to business and life. I look forward to creating more fountains on this scale for more wonderful people like him.